I love chocolate covered pretzels but these days...they are getting way too expensive to buy. 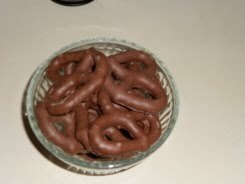 I decided to make my own chocolate covered pretzels and here is how I did it. You want to purchase the Baker's Chocolate that comes in a microwavable cup. I simply read the instructions and melted my milk chocolate in the microwave. I then used an old pair of tweezers (cleaned of course) and used them like tongs to dip my small pretzels into the melted milk chocolate. I then laid them out onto my nonstick silicone baking mat and left them firm up. Really easy to do and they taste delicious!